Red Bull have been using the duct in front of the rear tyres for a number of races. It seemed that at Monaco one the teams may protest its use and force Red Bull to start from the pits having to change the floor on both cars. Red Bull are not the only team to have a similar element on their car. Both Sauber and Ferrari have their own iterations. 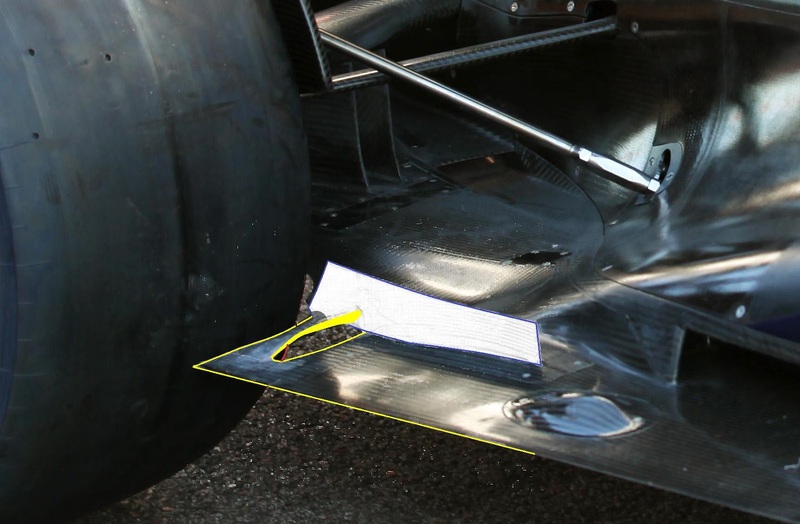 The reason for such a floor cut out is to reduce 'tyre squirt' this is when the flow that ejects from the sidewall of the tyre squirts into the path of the diffuser. 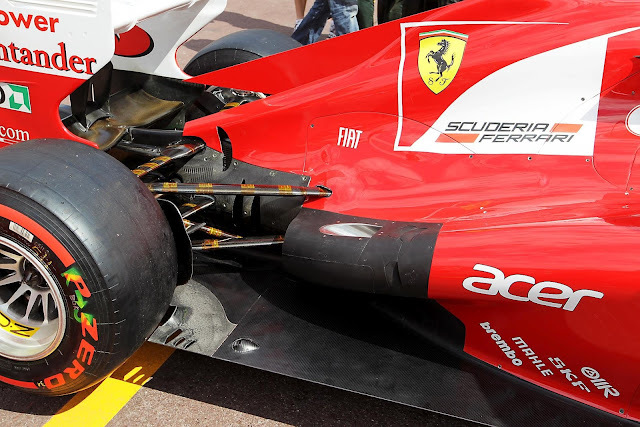 The slot/duct in front of the tyre redirects the airflow intended to hit the tyre head on minimizing the 'squirt' effect toward the diffuser. Squirt wasn't so much of a problem when EBD was in use as its impact on the diffuser flow wasn't enough to warrant the requirement of flow adjustment. 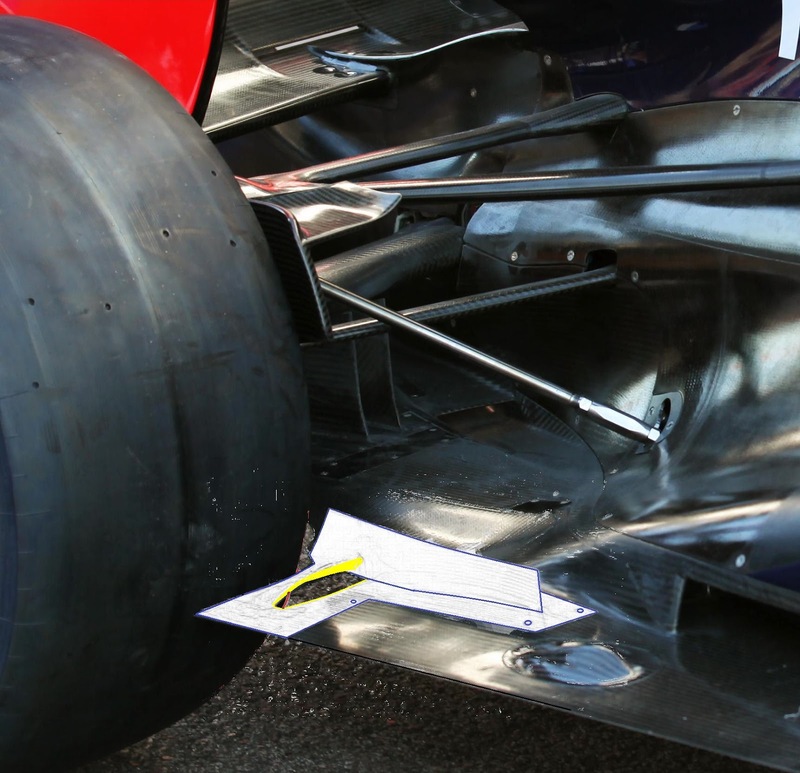 Red Bulls duct is totally different to Sauber and Ferraris iterations as they have a slot cut out of the edge of the floor or in the case of Ferrari the slots meet with the edge of the floor which circumnavigates the rule about having holes in the floor of the car. As always teams will always interpret the rules very differently and Red Bull are interpreting two separate rules here and joining them to form one. Instead of defining their slot on the outer edge of the floor (like Sauber/Ferrari, seen in the picture below of Ferrari's 3 slots at the edge of the floor) Red Bull are instead using the aero strake as a piece of bodywork thus the aperture is still a slot and not a hole. Had they enclosed the duct before reaching the strake it would be a hole. This has the advantage of being able to inject airflow further inbound to straighten the tyre squirt flow more than the Ferrari/Sauber solutions. In the picture below I have highlighted the sections in yellow that relate to the rules on the floor and in Blue for the section of aero strake that is defined as bodywork. (The strake is now in White) The small red mark denotes the edge of the tyre as it does look at first like part of the duct. As the two elements interact with one another both rules have to be deemed in play making this a slot and not a hole. If you're bagsying the Ferrari floor then I'll have first dibs on an RB8 one ;) Personally I think it's legal and just a clever interpretation of the rules. However defining it as legal in a statement of fact by the FIA may lead to other area's in which this could be exploited too.